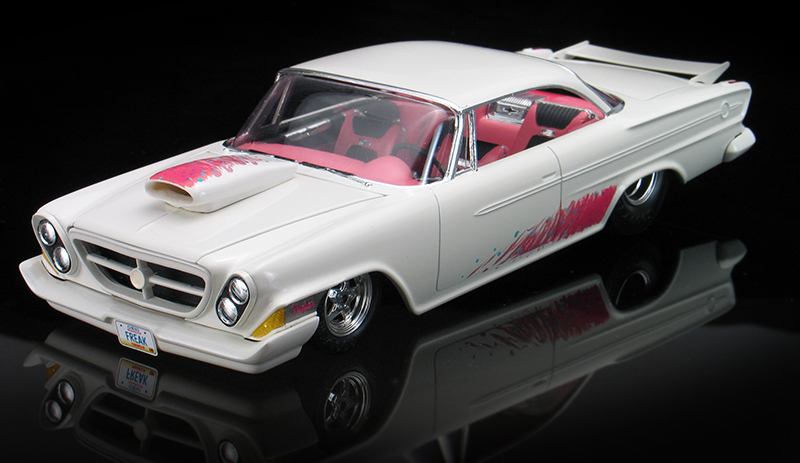 I originally built this 1/25th scale pro-street Jo-Han '62 Chrysler 300 model back in 1986. '86 was the height of the pro-street movement. Fed up with viewing a sea of pro-street Camaros and Novas at car shows, Hot Rod magazine wrote an article encouraging rodders to build cars that "dared to be different." I too, wanted to "dare to be different" and I scrounged the hobby stores looking for some unlikely pro-street material. 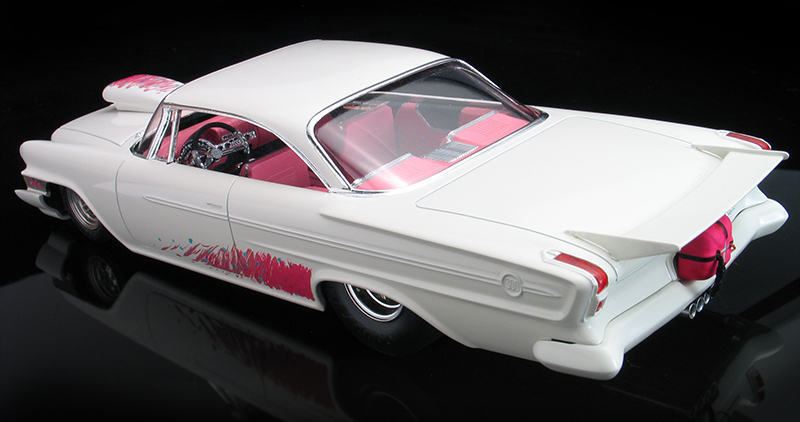 The Jo-han '62 Chrysler 300 kit was decidedly different. It fit the bill perfectly and became the basis for this unique '80's style hot rod. The early '60's Mopars had some of the most bizarre automotive styling ever. The '62 Chryslers even featured dual canted headlights, (all the rage in the early sixties, but were truly weird even by '80's standards.) This Jo-han kit had it roots back in '62, but by the '80's most people had little interest in Jo-han kits and I'd never seen one of these Chryslers built. All the more reason to build one. Back in those days, a form of model building called "slamming" was just starting to gain popularity too. Slamming was the act of gutting a model of it's chassis and interior, painting the windows black and gluing the wheels on however they would stick. (I usually used huge globs of silicone caulk.) It was a simple and fast way to get a pro-street look without having to go through all the extensive modifications of tubbing out a chassis and interior. The rest of the model was built curbside style and looked good sitting on the shelf as long as you didn't inspect underneath. I built a number of these style of models back then. This Chrysler 300 was the first. This model sat on my shelves for about 20 years or so, but after several moves it had started to deteriorate. The parts went into a model box a few years ago and sat awaiting a restoration. I sort of forgot about it for awhile. I was looking for a quick project to build over the holidays and stumbled across it and decided to re-build it. This time I made a few improvements. Slam models are sort of passe now, so I decided to replace the black-out windows and put a full interior in it. Luckily, I never get rid of any model car stuff, so dug through my parts boxes and found the original un-used interior parts. The painted window pieces were un-useable so I ordered a new set of vac-formed clear windows from the ModelHaus. Since this Chrysler was built back in the '80's, it's full of all the popular trends from that time: painted bumpers, pastel colors, dry-brushed graphics, etc. When my Chrysler was first built, I painted it using white Krylon spray paint. This was the first kit I ever used a polishing kit on and it came out really nice. The original paint was in good shape and shined up great with a fresh waxing. Although the interior is all new, I built it in an '80's style to keep it consistent with the rest of the car. Hard to believe know, but pink was a super trendy hot rod color in '86. I built the interior mostly stock, but I did add some contrasting gray paint and carpet flocking for a two-toned look. The oh-so popular '80's pro-street Weld Wheels and tires were taken from a Revell Bob Glidden Thunderbird kit. The hood scoop came from the AMT/Ertl pro-street '66 Nova and the rear wing was scratch built. I also notched the rear bumper and added the aluminum tube center exhaust. My Chrysler 300 is a time capsule and very dated looking by today's standards. Like most things though, it will probably come back into vogue someday. (Who'd ever thought gassers would come back in style? I thought those '60's style cars were really goofy when I was a kid in the '80's.) Although it's out of style now, it's still a neat model to have on my shelves and it's fun to see what my model building skills and interests were when I was younger.